Cycle Sport magazine: July issue out now! Cycle Sport July is now available in the UK, and it’s packed with superb writing, and the finest cycling photography, all for our usual low price £4.10. 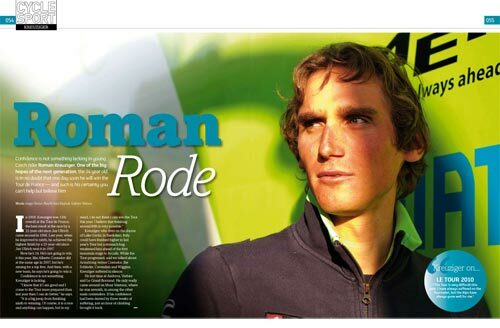 Our cover star, Christian Vande Velde, has been in the headlines for all the wrong reasons in the last week – the Garmin rider crashed out of the Tour of Italy on the first Monday of the race, breaking his collarbone. It is the second year in a row he’s suffered an early crash in the race. In a revealing, frank interview conducted on the eve of Liège-Bastogne-Liège, Vande Velde talks to Edward Pickering about where his quiet but strong confidence comes from, and one of his biggest motivations – proving people wrong. Don’t be fooled by the friendly smile and engaging manner – Christian Vande Velde is as hard as nails, and he’ll be a major factor at the Tour de France. Our interview also features stunning portraits by our photographer Richard Baybutt. 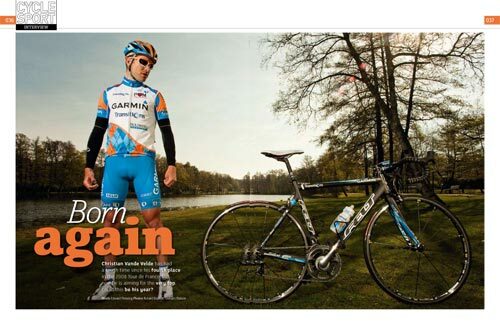 Exclusive interview and photoshoot with the rising star of Grand Tour cycling, Roman Kreuziger. All the talk of the Tour de France is that we’re set for an era of competition between Alberto Contador and Andy Schleck. But we’ve found that looking at achievement by age, Kreuziger’s results in the Tour de France are better than both. In coming 12th in 2008 at the age of 22 and ninth last year, the Czech’s results are the best by a 22 and 23-year old since Jan Ullrich came second, then first at the same ages in 1996 and 1997. Kreuziger explains to Cycle Sport’s Gregor Brown that he, Schleck and Robert Gesink are set to dominate the race in the 2010s, and also that when he wins the Tour, it probably won’t be with his current team, Liquigas. There’s also an interview with France’s most dynamic rider, Sylvain Chavanel, who tells Cycle Sport about his favourite thing of all – attacking. “I get bored when I’m just riding in the peloton,” he tells us. Chavanel has adjusted his sights in cycling – rather than pick up wins in small races, he’s going to concentrate on seeing if he is capable of winning a Classic, along with continuing his marauding riding at the Tour de France. The peloton is now well into the Grand Tour season. But we’ve taken one last in-depth look back at the Cobbled Classics in a special series of eyewitness reports. Photographer Tom Simpson went to the Kemmelberg at Ghent-Wevelgem to capture the atmosphere of the famous cobbled climb. While the organisers tried to shake up the race with the introduction of a new series of climbs, the fans knew better, ignoring the new climbs and flocking in their thousands to the Kemmelberg. Our pictures show cycling fans at their most passionate. Alasdair Fotheringham spent the week of the Tour of Flanders in the most high-pressure environment in the sport, embedded with the Quick Step team in advance of their biggest target of the season. In this unique and revealing diary, we see the pressure and excitement within the team building to a peak on the day of the race, before sharing their disappointment at Tom Boonen’s defeat by Fabian Cancellara. We also have a roadside report from the Queen of Classics, Paris-Roubaix. Sam Dansie followed the race, from the nerves and excitement of the start in Compiègne, along the cobbles en route, to the incredible finish at the Roubaix velodrome. We experience both the joy and disappointment of the race, through the eyes of the Garmin team. 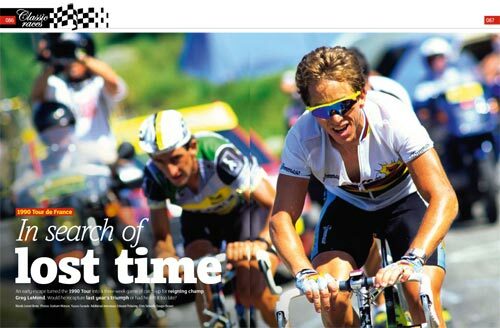 Our Great Races feature this month looks at the absorbing and unpredictable 1990 Tour de France. The 1990 race gets a bad rap – it could never equal the drama of Greg LeMond’s eight-second victory in 1989, and it is often written off as a dull edition of the race. But it was actually one of the most unpredictable Tours in history. The race was influenced by an incredible 10-minute escape on the first road stage, by Claudio Chiappucci, Ronan Pensec, Steve Bauer and Frans Maassen. It took eventual winner Greg LeMond almost three weeks to get that time back – he was hamstrung both by the fact Pensec was his team mate, and that Chiappucci was far stronger than anyone expected. We’ve talked to LeMond, all four men in the famous break, and third and fourth-placed Erik Breukink and Pedro Delgado to get the inside story of a fascinating and tense race. Iconic Places goes to the Col de la Madeleine, which features in this year’s Tour de France on stage nine to St Jean de Maurienne. This Alpine brute is a triumph of engineering and is one of the toughest and most beautiful climbs in the Alps. Chris Sidwells explains its history and place in the Tour de France, and looks forward to the 2010 race adding to the legend. Pro Performance features an interview with Sky’s Russell Downing, a rider whose gradual, almost painful, ascent to ProTour level is diametrically opposite to Sky’s famous scientific ethos. But the two have more in common than you might think – Downing has even dealt with his ‘Inner Chimp’. “I took him out one night and got him drunk and I’ve not heard from him since,” Downing informs us. 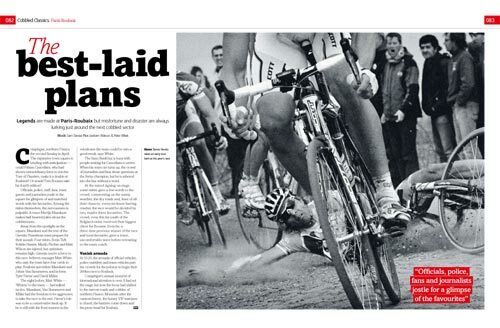 Plus…all our regular features – Graham Watson showcases his best pictures from the Classics; Broomwagon; Post-Race Banter explains Amstel Gold; Shop Window; Bike of the Month looks at Cancellara’s Specialized Project Black; Shop Window; a Q&A with Belgium’s improving climber Kevin Seeldraeyers; Toto, featuring Cav, British dentistry and Mario Cipollini; Clash of the Month; Top 10 intra-team feuds; We analyse the stats behind the Spring Classics, welcome Alpe d’Huez back to the ProTour, work out Cadel Evans’s VAM on the Mur de Huy (2,548m/h!) and much more. That’s nine in-depth features, and 140 quality-packed pages, for our usual low price of £4.10. 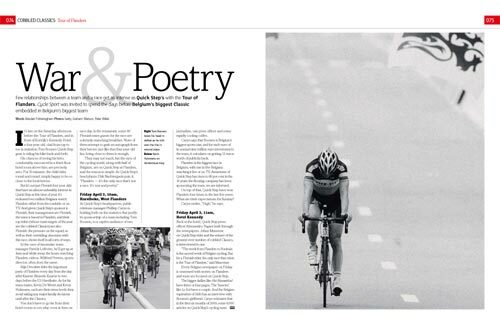 Cycle Sport July is now on sale in the UK, and will be available later in the US.